The undercollar is the blind stitch the material in order to prevent contamination of the collar. To sew the undercollar to the form seems to be not a difficult task. However to do this properly, you need to consider some nuances. Please note that the undercollar is a narrow piece of white cloth of rectangular shape. Sew it yourself or buy ready-made, stitched in a specialty store where the item is available in several sizes. 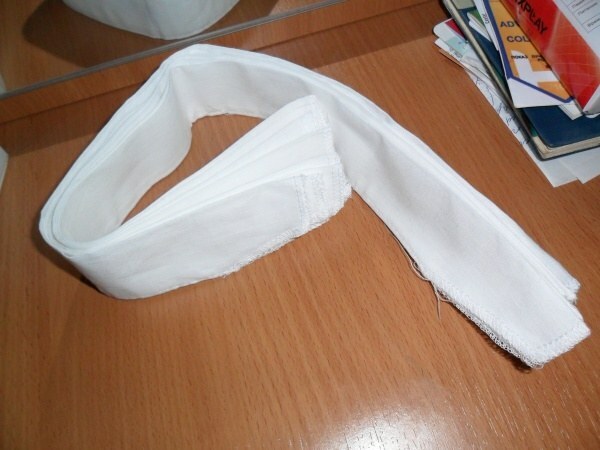 With self-manufacturing material blind stitch fold the thick white cloth in half. Thus the undercollar will be more durable. Tutuila carefully blind stitch the material and the collar shape. Prepare a strong thread of white color with a length of 70-100 centimeters and a needle. Carefully begin to sew the undercollar to the collar on the reverse side. Try to achieve such a result, to the thread on the front side was not visible. To do this, the needle must be stick on the outside is very close to the place where it came out. Don't forget that the undercollar needs to be on the top and front of one millimeter. It is desirable that the number of stitches in the upper part of the blind stitch of the material was equal to 12, and the bottom – 6. Check exactly whether sewn undercollar, there are no folds anywhere. Upon detection of any flaws, blind stitch fabric fight back and start sewing again. Don't worry if the first time the suturing of the collar will seem very difficult or even impossible. With experience, you without problems will cope with this procedure in less than one hour. Hemming the collar of his jacket before demobilization (if you serve less than a hundred days), if you want to use black thread. Some soldiers even embroider the number of days remaining before the order. Undercollar protects the jacket from dirt and therefore changes every day. The soldiers try every time to sew a new fabric, because even once washed, it will no longer be white as the original.